WASHINGTON: President Donald Trump declared Thursday that the United States should recognise Israel's authority over the long-disputed Golan Heights, delivering a valuable election-eve gift to Prime Minister Benjamin Netanyahu but jettisoning decades of US policy in the Middle East. Trump's announcement, in a midday Twitter post, came after persistent pressure from Netanyahu, a close political ally who is fighting for his survival in the election scheduled for April 9 and has invoked his friendship with the US president as a prime argument for staying in office. But Trump's move, while popular in Israel and among some lawmakers in Congress, is likely to be condemned almost everywhere else. The United Nations has rejected Israel's occupation of the Golan Heights since 1967, when Israeli troops seized the 400 square miles of rocky highlands from Syria during the Arab-Israeli war. It will also reverberate throughout the Middle East and could undermine Trump's long-anticipated peace proposal for Israel and the Palestinians. The White House has been enlisting support for the plan among Arab leaders who now face the prospect of acquiescing in the loss of land they have long claimed as Arab. As a practical matter, Trump's announcement changes little. There is no negotiation underway on the status of the Golan Heights, nor any expectation that Israel is going to withdraw from it. The United States could veto any UN Security Council resolution condemning the move. But as a symbolic step, the decision is momentous - underlining Trump's willingness to flout diplomatic orthodoxy and shake up a debate over the Middle East that has changed little since the 1970s. "I've been thinking about doing that for a long time," Trump said to Fox Business Network in an interview scheduled to air Friday. "Every president has said 'do that,'" he said, "I'm the one that gets it done." 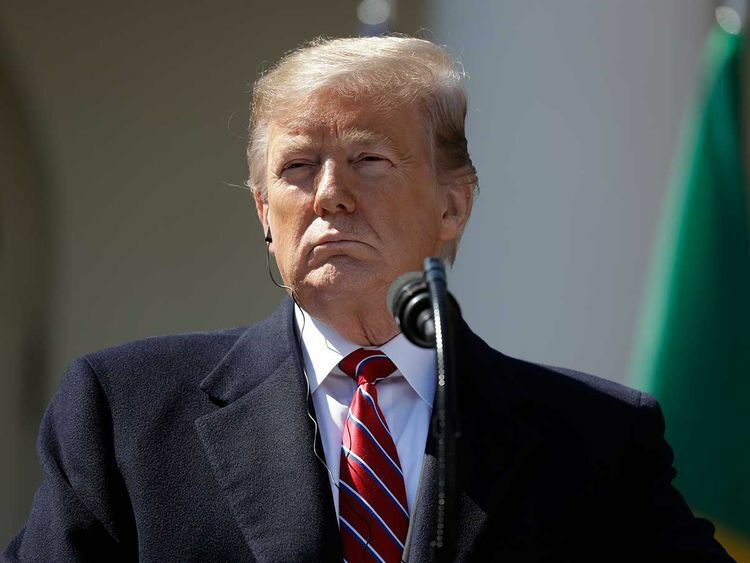 Trump brushed aside suggestions that he was trying to help Netanyahu in the election, professing to be only vaguely aware of the Israeli leader's political challenges. He plans to welcome Netanyahu to the White House on Monday. Yet unlike the president's earlier decision to move the US Embassy from Tel Aviv to occupied Jerusalem, which was mandated by Congress and fulfilled a promise he made during the 2016 presidential campaign - one made by previous presidential candidates - this latest move was both a first for a US president and almost purely a gesture to Netanyahu. "President Trump has just made history," said a beaming Netanyahu, who said he called the president to thank him on behalf of the Israeli people after his tweet. "He did it again." Praising Trump for moving the embassy and for withdrawing the United States from the Iran nuclear deal, which Netanyahu stridently opposed, the prime minister said, "The message that President Trump has given the world is that America stands by Israel." Netanyahu called it "a miracle of Purim," referring to an ancient Jewish holiday being celebrated this week. Palestinian officials, who have been alienated from the Trump administration since it moved the US Embassy to Jerusalem, predicted that the latest move would ignite a new wave of violence in the region. "What shall tomorrow bring?" Saeb Erekat, a veteran Palestinian Authority peace negotiator, said in a tweet. "Certain destabilisation and bloodshed in our region." The announcement was the latest in a series of steps that have radically reshaped the United States' role in the conflict between Israel and the Palestinians - overwhelmingly to the benefit of Israel's right-wing government. The president cast his decision as being of "critical and strategic importance to the state of Israel." Other administration officials and defenders of the policy, including Republican senators, said that Israel's control of the Golan Heights was critical, with Hezbollah and other Iranian-backed militants threatening it from inside war-torn Syria. In Jerusalem, Pompeo appeared caught off-guard by the timing of Trump's tweet. Hours earlier, Pompeo told journalists that the United States' long-standing policy on the Golan Heights had not changed. He then visited the Western Wall with Netanyahu - the first time that a US Cabinet official had done so with an Israeli prime minister. Still, Trump's announcement puts him at odds with international law and decades of US policy. The United Nations and the United States have steadfastly refused to recognize Israel's seizure of the Golan Heights or the West Bank, arguing that the contours of Israel and a new Palestinian state must be negotiated diplomatically. In 1981, when Israel effectively annexed the Golan Heights, the Reagan administration retaliated by suspending a strategic cooperation agreement between the United States and Israel. Israel, however, has continued to administer the territory as part of its country, and the Jewish population there has grown with the expansion of Israeli colonies. Since the outbreak of war in Syria in 2011, and the intervention of Iran and Russia, there has been little international pressure on Israel to pull out of land. Former diplomats said Trump's action was unnecessary and would inflame an issue that had been largely dormant. They also said it would embolden other world leaders who seized territory in violation of international norms. "Putin will use this as a pretext to justify Russia's annexation of Crimea," said Martin Indyk, a former peace negotiator and US ambassador to Israel. "The Israeli right will use it as a pretext for Israel's annexation of the West Bank. It is a truly gratuitous move by Trump." Dennis Ross, another former Middle East negotiator, said the move would make it more difficult for Arab leaders to support the plan being drafted by Trump's son-in-law and senior adviser, Jared Kushner. The White House is expected to table the plan after the Israeli election. "If it looks like they're acquiescing to the giving up of Arab land, that makes it harder for them to support a plan that will require other compromises," Ross said. "If what you wanted to do was to present a plan that is likely to succeed, this is not a step you would take." When he is in Washington, Netanyahu is expected to speak at the annual conference of the American Israel Public Affairs Committee, a pro-Israel lobbying group that has wide support among US politicians. As they did after the embassy announcement, Trump administration officials said the Golan Heights decision merely recognized reality - something that is necessary for the Israelis and Palestinians to achieve peace. "Under any conceivable circumstance, Israel could not give up the Golan," said Jason Greenblatt, Trump's envoy for Israeli-Palestinian negotiations. "To do so would endanger Israel's very existence. What President Trump did today was to recognize this." "No one who understands the region would think that Israel would allow the Golan to be controlled by the failed-state of Syria or by rogue actors operating in the area, including Iran," he added. "Postponing that realization does nothing to advance the cause of peace or regional stability." The Arab League condemned the decision, describing it as "completely beyond international law." "The Arab League stands fully behind the Syrian right to its occupied land," the secretary-general of the league, Ahmed Aboul Gheit, said in a statement carried by Egypt's state news agency MENA. Before Trump's statement, Syria's ambassador to the UN in Geneva, Hussam el-Din Ala, warned against Israel's "malicious attempts to exploit the situation and the latest developments in Syria and the region to consolidate the occupation" of the Golan Heights. Critics of President Bashar Assad of Syria have noted that for as much as he and his government have talked about "liberating" the Golan Heights, they have taken little action to do so in decades. During the early years of the Obama administration, US diplomats tried to broker a peace deal between Israel and Syria. It called for Israel to agree to return the Golan Heights if Syria pledged to stop funneling rockets to Hamas and Hezbollah. The talks broke down after Assad's government cracked down on anti-government protesters. Fred Hof, a former State Department official who led those talks, said Thursday's announcement would "be welcomed by Israel's bitterest enemies - Iran and Hezbollah - who would see annexation as additional justification for terror operations." He also said it would allow Assad to change the subject from his war crimes to Israel's unlawful occupation.